Featuring stories by writers Thomas Israel Hopkins, Cynthia Blank, Ellen Weeren , and Rudy Koshar; read by actors Olivia Killingsworth, Alex C. Ferrill, Kira Davies, and Ari Brand. 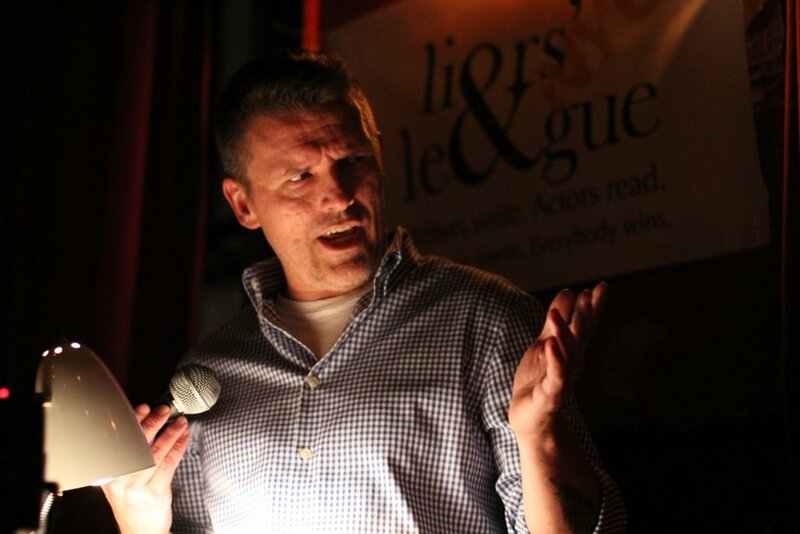 Hosted by Andrew Lloyd-Jones at KGB Bar on 3rd October 2018. Sometime around two o’clock on Sunday morning, the small hours of Halloween, my date took a break from telling me stories about her former life as a stripper and got up to go to the ladies’ room. We were having a drink at Marion’s in the East Village. I noticed for the first time that the man seated to my left was by himself. He had small, buggy eyes behind enormous black Elvis Costello frames. He looked like a haunted Peter Falk, drained and dissipated, thirty quickly going on sixty. On his tenth birthday, Kayare woke to the cold of metal pushed so potently against his palm that he could almost taste the metal in his mouth. The tang of it was rich like honey, only not so much sweet as necessary. Under his pillow, his father Baba had left a camel bone handled knife with a red string tied several times around its finger groves. Its blade curved like a crescent moon. Kayare recognized the knife as his grandfather’s, Dadaji. How proud he would have been to see it set so firmly against Kayare’s skin. Kayare never imagined a blade could feel so frigid. It was a warm summer evening in early August and the sun hung restlessly in the air, waiting to descend into the Hudson River. The streets were bustling, overflowing with the smell of sour milk, overripe fruit, and the occasional whiff of perfume. Jake emerged from the crowded Union Square subway exit, and began walking in the direction of First Avenue. Off his meds for three months, and Daniel was in a twisted, giddy, mad orbit. Buildings sang to him—fast, gibbering songs with high-pitched keening and clashing cymbals and raucous, swelling guitar riffs that drowned out the world. The songs often scared him, but cacophony was better than the hollowed-out, woozy sensation the drugs gave him.